Everyone loves a picnic. Food always tastes a lot better eaten outdoors, and if you're lucky enough to have your children's birthdays fall during the warmer months, you're in business! There's no need to spend too much time worrying about the perfect picnic. Younger kids will be more than happy with traditional fare, consisting of cheese and jam sandwiches, packets of crisps, sliced carrot and cucumber plates, sausages, bowls of grapes and individual cheeses, and a birthday cake. But if you want to try something a bit more adventurous, here are some delicious ideas for food which both children - and their parents - will enjoy! Bagel sandwiches. Spread bagels with cream cheese, stack on plate and cover with clingfilm. You can add smoked salmon if desired, you can also buy mini-bagels and make stacks of mini-sandwiches. Croissant sandwiches. Buy large croissants in bulk at the supermarket. Slice open and fill with either cheese and tomato or ham and cheese. Homemade wraps. Purchase tortilla wraps, fill with a variety of fillings including tuna and sweetcorn, ham and cheese or Coronation Chicken. Pasta salads. Be creative and prepare several pasta dishes that are delicious eaten cold. Add pesto and pine nuts over fusilli; tomato sauce, chopped tomatoes, parsley and diced black olives over butterfly pasta. If you do include nuts of any kind, let the parents be aware in case of any potential allergies. Finger foods. Prepare plates of yummy finger foods for guests to dip into as they please, including chicken drumsticks, sliced pizza, mini kebabs, fruit skewers, sliced veg and dips etc. Younger kids will also appreciate tubes of yogurt, packets of teddy bear crisps and other individual-sized goodies. Desserts needn't be elaborate to be tasty. Biscuits, brownies and small cakes that travel well outside are always a favourite outdoors. And you can always plan your picnic around the ice cream van! A classic American outdoor sandwich that's tangy and tasty. Heat the oil in a pan and cook the mince and onion with the salt and pepper until well-browned. Sprinkle the flour over the mince mixture and stir well. Next add the ketchup, Worcestershire and water and mix together. Then simmer for about 20 minutes until it has thickened. Serve the mince in the buns and enjoy! These tangy drumsticks will have them coming back for more! Place the honey, chilli sauce, tomato sauce and soy sauces in a large non-metallic dish and stir. Cut 3 diagonal slits across each drumstick. Coat the drumstick in the marinade, cover and refrigerate for 2 hours or overnight (If your really organised an have planned ahead! )Turn the marinade 2-3 times. Preheat oven to 180 degrees C, gas mark 4. Now line a large baking tray with baking paper and place the drumsticks on the tray. Bake for 45 minutes or until cooked, turning and brushing with the marinade 2-3 times . These can be eaten warm or cold, Yummy! This is a lot easier than it sounds – and it makes clean-up easier as well! One trick is to not over-stuff the boxes, have additional food on hand that kids can graze on if they're still hungry. Individual boxes can be great fun, and you can encourage your own children to decorate them beforehand with stickers, drawings and the guest's name on each one. Hint: Leave all sweets out of box to discourage children from eating them first. You can serve dessert to everyone at the end of the meal. Make food that is easy to transport to the picnic spot. Prepare food that can be eaten either hot or cold. Bring not only food, drinks, plates, cutlery and napkins to the picnic, but also bin-liners and wetwipes. 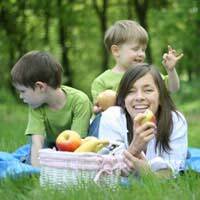 Ask other parents to bring picnic blankets, as you can never have enough. Make sure you have lots of extra drinks on hand – especially water – as kids will run around and get thirsty outside. Put biscuits etc in bowls instead of plates, as plates tend to tip over more easily on picnic rugs.